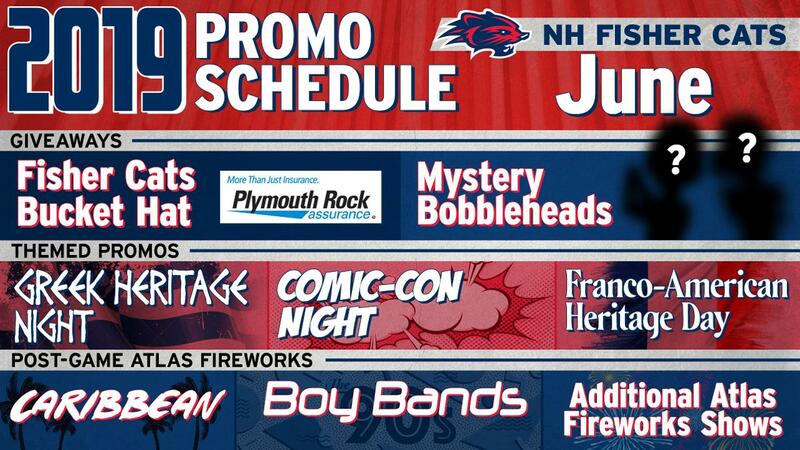 The Fisher Cats Promo Schedule Roll Out Continues! What better way to celebrate summer's official return than with a pair of action-packed homestands? Yes, the team is on the road for a majority of the month (there are only 12 home games in June) but we're not skimping on the Ferocious Fun. Our first foray into the Hellenic Republic will be filled with festive music, food and more. Who doesn't love steel drums and rum? We'll honor the Granite State's finest prep athletes with an evening of applause and adulation (with plenty of antics mixed in). Did you know the bucket hat originated in Ireland just after the turn of the 20th century and was favored among outdoorsmen as a functional piece of headwear? We didn't, and now we both do. You'll get one if you're among the first 1,000 through the gates on this night. No pop culture reference is too obscure (much to the delight of our GM Jim Flavin) for one of our biggest theme nights of 2019. Your favorite hits from the angelic voices of an era. Bleached blonde hair not required. Themed jerseys and a French public address announcer are just the beginning for the third iteration of our celebration with the Franco-American Center.